With churches across the globe celebrating the season of Advent, so many special services are taking place to observe this special time of year. Of course, churches have year-round services, festivities, and celebrations that highlight the message of their beliefs. From backyard Bible schools to classes for new members, share the message of your church to those who need the hear the message within. Electronic message centers Atlanta help churches and businesses communicate a message to welcome new guests. In just under two weeks, a lot of churches will congregate on Sunday, Dec. 24. Some will do a morning service, and some will do a night service; some will do both. The candlelight service is a longstanding tradition annually held the night of Christmas Eve. Every year, countless churchgoers congregate in celebration of the reason for the season. The night is usually capped off with everyone in attendance holding up a lit candle, singing beautiful holiday classics such as Silent Night. It’s a nice break from the hustle and bustle of the holiday season, allowing you to refocus on the true reason for the season. The candlelight is the perfect time to bring in guests, as many who don’t have a church home might pick yours to worship with that night. How will they learn the details of the service? Pastors do such a great job every year sharing their message, but can the same be said about the sign of their church? When we think of church signs, what comes to mind first are the witty roadside swingers. Their messages usually make us laugh and get shared on social media, but it’s not necessarily the attention a church or business needs to get people in the door. 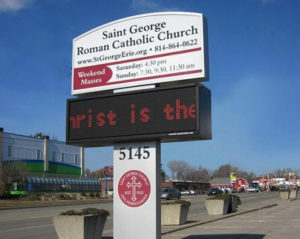 A professional sign that reflects and showcases your worship services will welcome guests in the most appropriate way. Electronic message centers Atlanta are attention-grabbing, informative, and professional-looking signs that can encapsulate your church’s message, mission, and purpose. Through letting your congregation and guests know about the upcoming Advent services, take your church’s signage to the next level with Apex Signs & Graphics. Whether members, regular attendees, or seekers, everyone will take notice of electronic message centers Atlanta. For all your signage needs, Apex Signs & Graphics is here for you. Contact Apex Signs & Graphics at 678-795-0775. For more on how signage can help welcome guests to your church, connect with us on Facebook, Twitter, and LinkedIn.